Home→HRM→Following the Rainbow to the Pot of Gold: Don’t Depend on Irish Luck! Remember you’re on the same team! Approach things from the same side, together, through clear directives and objectives, mature mediation, and consistent performance reviews which focus on improvement. Getting to the Gold can be stressful, so it’s important to work together! Out with the old, in with the new. Spring approaches, and with it, spring cleaning! Could anything around the workplace do to see some tidying, reorganizing, or cleaning? There’s no room for new gold with too much old dust! Perhaps a good time to host that Cleaning Competition among employees – what prizes might be won for the award of Cleanest Workspace? Or for Most Creative Work Station? Boost morale with a fresh clean workplace. Yelling scares the Leprechauns away! Leprechauns are skittish creatures – they disappear with lost morale or anxious antagonism, so try a gentle but direct approach for communication. Do your managers lead from On High or through their own example, with patience and eye on a prize? It’s never too late for managerial trainings! That’s pure gold right away. Give your employees a leg to stand on. March can be a rather mushy, muddy month – have you given your employees firm ground to stand on? Even long-time employees can appreciate a good check-in about how they’re handling their projects, any concerns for the year ahead, or any ideas for improvements. Everyone likes to have a steady place to stand or sit! Bring in a dash of spring. Perhaps your company works outside, privy to the change of the seasons, the fresh green leaves, and the flowers to come: even so, it can be a nice surprise to bring a bit of the outside in! Out with the winter dust and in with the spring flowers, but mind the April showers or the only footsteps to follow will be your workers’! Imagine the possibilities. Spring is a great time for making changes, trying things a new way (and being open to feedback), or looking at things from a new angle to encourage fresh growth of networking, clientele, projects, company missions, and even charity! Veer on the side of cautious risk-taking. 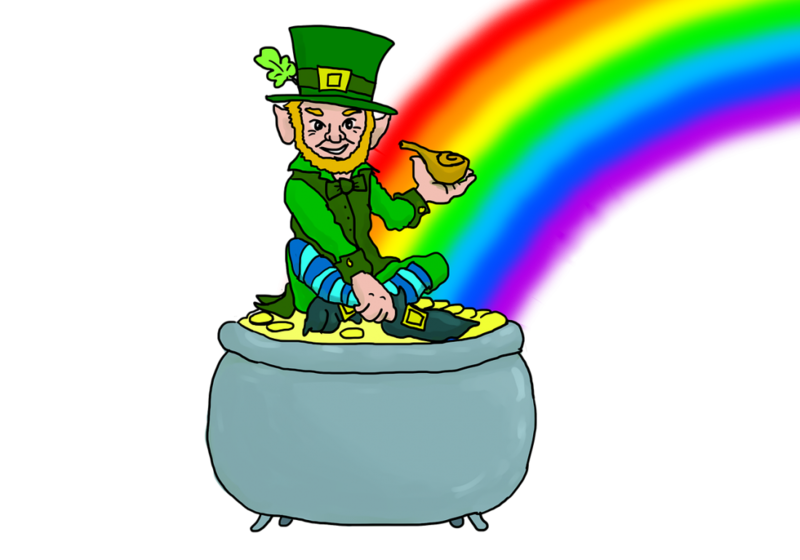 Following the rainbow to its pot of gold is very exciting, but it’s not without known risk (Leprechauns are mischievous creatures and not all that glitters is gold). The best way to ensure good risks rather than unfortunate issues or getting lost in litigation is to have all policies and procedures down pat in well-organized, consistently updated forms (like employee handbooks) which remain easily-accessible to employees or clientele who need to be in the know. There’s no better way to remove obstacles from your Path to Gold than good, old-fashioned preparation! Are your policies up-to-date for the adventurous business ahead? With these colorful cobblestones in place, you won’t need luck to get to the pot of gold—but if the winds of spring or the wink of a little fey being brings you luck anyway, it’s a great time to show your gratitude! There’s no better time for a fresh new attitude than the season ahead; and with a good attitude, you’ll stand a head taller than the competition. Just watch out for the little guys: they’ve got as many tricks and traps as they have gold. And with that in mind, have a lucky St. Patty’s Day and Irish Heritage weekend leading right into a proudly productive spring!